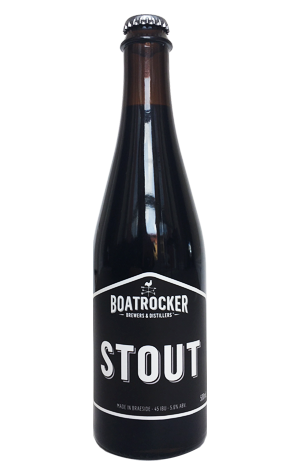 The sinuous evolution of the Boatrocker range continues as winter 2018 approaches, with the arrival of the previously draught only Stout in bottles. If you've not tried the beer before, said bottle gives you a pretty good inkling of what's to come; none of the brewery's wilder flights of fancy, blends, adjuncts or barrel influences here – this is a straight down the line, no nonsense stout. If you were to place it on the sliding stout scale, it might be pegged slightly nearer the sweeter end, not because there's any lactose or particularly rich malts in there, more because there's little in the way of any sharp or acrid roastiness. Instead you'll pick up a little dark liquorice and some twiggy hop characters alongside the dusty dark cocoa and chocolate on the nose, with flavours dominated by high percentage couverture chocolate and flashes of dark fruits. What bitterness is there is more drying than anything in what is, quite simply, just a good stout.